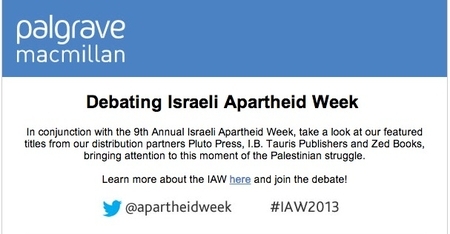 Palgrave Macmillan Participates in "Israel Apartheid Week"
In conjunction with the 9th Annual Israeli Apartheid Week, take a look at our featured titles from our distribution partners Pluto Press, I.B. Tauris Publishers and Zed Books, bringing attention to this moment of the Palestinian struggle. Palgrave Macmillan would like to express our regrets for the e-mail sent in error on Monday morning. While many of our authors have published seminal works debating various aspects of the Israeli/Palestine conflict, and Palgrave Macmillan is committed to promoting scholarship, research and debate on this difficult topic, we would never endorse one particular political point of view. The wording used in the e-mail is unacceptable, and the e-mail does not represent the views of Palgrave Macmillan, distribution partners or its employees. The e-mail was sent without having gone through the usual checks and processes, for which we sincerely apologise. We are working with the team involved to find out how this happened, and to ensure it does not happen again. I hope you will include our response on your blog – do not hesitate to call me if you have any questions. Congratulations to Palgrave for its quick and complete reversal. I am happy to renew ties to this important publishing house.